Lawyers must undergo extensive educational training and testing before they're licensed to practice. The exact requirements can vary somewhat by state, but educational requirements for lawyers always include certain degrees and exams. You'll need a four-year undergraduate degree followed by three years of law school and a juris doctorate (J.D.) degree. A J.D. is awarded by law schools that are accredited by the American Bar Association. You must then pass the bar examination. Each state has its own bar association, so you must pass in the state in which you want to practice. You must then additionally pass an ethics examination in many states. A four-year degree from an accredited college or university is a prerequisite to acceptance at an ABA-accredited law school. The ABA doesn't recommend any one area of study, nor do law schools show any particular preference for one major over others. Students are not required to major in pre-law. Law schools accept such a diverse pool of applicants with many different majors and backgrounds that you can fine-tune your major to your ultimate career goals. For example, you might want to major in business if you hope to eventually pursue business law, or in sociology, if you want to work in the public sector. A major in accounting might be practical and helpful if you want to work in tax law. Earning a bachelor's degree doesn't ensure that you'll be accepted to a law school. You must also take and pass the Law School Admission Test (LSAT) before you can apply to law schools. Admissions officers put a great deal of weight on LSAT scores; ABA-accredited law schools won't accept applicants who haven't taken the test. The LSAT is a half-day standardized examination that tests the analytical and reading comprehension skills considered necessary to succeed in law school. It includes five multiple-choice sections as well as an unscored writing test. Your LSAT score can also factor in determining financial aid. It's recommended that you take the test by October of the preceding year if you're hoping for fall semester admission. Lawyers must graduate from a law school approved by the American Bar Association and have their J.D. to qualify for the bar examination in most states. ABA accreditation signifies that the law school has satisfied and sustained certain standards established to ensure a quality legal education. Not all law schools are ABA-approved, and attending a non-ABA approved school can significantly hinder your employment prospects. 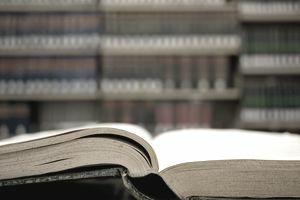 Law school typically involves general courses as well as core subject coursework, including constitutional law, international law, business law, criminal law, courtroom procedures, and civil procedures. There's no single standard curriculum; they can vary somewhat from school to school. You can usually begin taking specialized courses midway through your second year, and you can also begin applying for externships at this time. Working as an attorney requires more than just a solid educational background. A certain skill set can help immeasurably as well. Attorneys can hone these skills through opportunities such as internships. Many law students apply for these positions as undergraduates. They involve working for a law firm or organization for a prescribed period of time, often during the summer months. It's hands-on experience performing various jobs under the supervision of an attorney. Competition for these positions is typically fierce, so you might want to consider an externship as well. The process is similar, but externs typically work for nonprofits and government entities. In either case, it's an opportunity to polish skills that aren't typically taught in law school. For example, a successful lawyer will be keenly argumentative—in a good way. A knack for critical thinking is important, as is the ability to negotiate and persuade. Superior writing skills are as important as speaking skills. Time management is crucial. They're all things that can be learned working side by side with an experienced lawyer for a period of time. Law school graduates who want to be admitted to their state's bar must pass a two-day examination that tests general legal principles and substantive knowledge of the law. The exact format can vary by state, but one day of the examination usually consists of the Multistate Essay Examination (MEE)—six 30-minute essay questions—and the second day involves a series of questions designed to test knowledge of that particular state's law. The exam might also include other tests intended to measure understanding of professional conduct. Most states also require lawyers to take an ethics examination, the Multistate Professional Responsibility Examination (MPRE), as well. It's a two-hour, multiple choice test, and only two states and Puerto Rico waive this requirement as of 2018: Wisconsin and Maryland. Students can take this examination during law school in some states, usually after completing an ethics course. Admittance to the state bar might not depend solely on how well you perform on the bar exam. Bar examiners in some states also consider the applicant's character. Most states require that lawyers take continuing education courses throughout their careers to keep current and to maintain their licenses to practice. The median pay for attorneys as of mid-2017 was $119,250 annually, according to the Bureau of Labor Statistics. This number falls right in the middle of the salary range. There were more than 1.3 million practicing attorneys in the U.S. in 2016, yet job growth between 2016 and 2026 is estimated to be about 8 percent. Approximately 65,000 more jobs are expected to open up by 2026. But there are still more students graduating from law school each year than there are jobs available for them. This makes achieving excellent LSAT and bar exam scores even more critical so you stand out from the rest of the pack. The J.D. is the most common law degree, but you might also want to pursue a master of law degree or doctor of judicial science degree depending on your aspirations. The doctor of judicial science degree is the highest and most prestigious law degree available and recognized in the U.S. It's a second degree that can only be acquired after successful completion of the J.D. or a master of law degree. It, too, is a three-year degree. Most law professors have the distinction of having earned doctorates of judicial science. A master of law degree also requires first completing the J.D. It's a one-year degree that allows you to focus on and specialize in a certain field of law.